Libby Whaley finally has the restaurant she has wanted to open since she started in the food business as a 14-year old. A silent partner gave her the opportunity with a well-timed phone call. "This couldn't have come at a better time for me," Whaley said. She was between jobs and spending most of her time babysitting her grandchildren. "I love my grandkids but I have to be moving." Now Whaley is moving about her new namesake restaurant, Libby's Diner, located on Decoursey Avenue in Latonia. The space previously was home to Bard's Burgers which closed last November. While Bard's was famous for its Bardzilla, a monstrous stack of hamburger patties that very few people were able to eat in its entirety, Libby's will keep things more reasonable, though a triple-decker burger is available. Mostly, new customers at the two week-old diner have enjoyed the breakfast all-day option. Mama's Favorite is two eggs, fried potatoes, bacon or sausage, and toast. Pappy's Delight is two eggs, biscuits & gravy, and bacon or sausage. Other choices include the Latonia Special, homemade chili, and appetizers like potato skins and Libby's soon-to-be-famous pickle chips. Libby's also serves the American staple of burgers and fries, which is good because much of Bard's old signage advertising such still adorns the building's facade. Whaley is still waiting for permanent signage for her new place, one of several planned improvements. Currently, the diner operates from 7 a.m to 5 p.m. but Libby's will offer dinner soon and may also open 24-hours on the weekends. "I think once dinner starts, I want to do a meatloaf night, Cajun night, Italian night," Whaley said. "I make a really good lasagna." The choice is hers, finally, after starting as a teenaged waitress at the old Marty's Welcome Inn on Taylor Mill Road which preceded stints at the Log Cabin Inn in Falmouth, Tickets in Covington, and a spot in New Richmond. "Right now, nobody knows we're here so I'm trying to get it going," Whaley said. Next door to the new diner is another new enterprise specializing in electronic cigarettes, an increasingly popular alternative to the real, more harmful thing. "We sold half our inventory before we even opened," said co-owner Chad Dye, a Pike County transplant. He and his fellow co-owners (there are three total) are already moving forward on opening a second location in Erlanger. Not bad for a days-old operation. The Decoursey Avenue space is sparsely furnished and decorated currently but Dye and his partners have plans for a seating area where customers can watch TV while vaping. 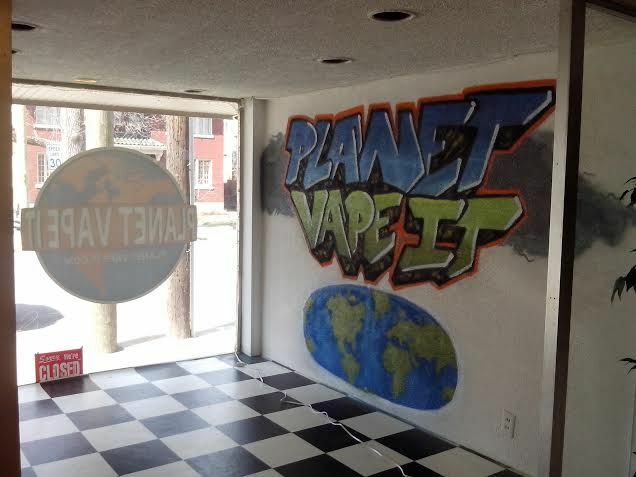 Those seeing an alternative to tobacco-filled cigarettes can pop into Planet Vape It and buy a $30 kit. The various flavors of liquid cost $5, cheaper than most competitors, Dye said. One of the owner's girlfriends had been smoking the alternative for a while and said that she would often stand in long lines for refills. That's when a light bulb went off and the trio pursued it as a business venture of their own. Dye said he likes the Latonia location at Ritte's Corner, even though parking can be a bit of a problem. "I like it. A lot of people walk here," he said. "Most of our customers are within walking distance."